Pamela Hargest of the UMaine Cooperative Extension service will present “Starting Seeds Indoors” from 10-11:30 a.m. Saturday, April 13, at the Bridgton Public Library. All are welcome to come see how to get a jump start on this year’s gardening season. For more information call 647-2472. Registration and screening for SAD 61 kindergarten for the 2019-2020 school year will take place April 23-25. The required screenings will be held at the Crooked River Adult and Community Education Center, 1435 Poland Spring Road, Casco. Children who will be 5 years old on or before Oct. 15 are eligible to attend kindergarten (Stevens Brook Elementary in Bridgton). For more information and to schedule an appointment, call 647-5675. Newly revitalized American Legion Post 67 in Bridgton has announced that Veteran Service Officer Kelly Ela will be available for consultations from 9 a.m. to 1 p.m. every Thursday at the Bridgton Community Center, 15 Depot St. Kelly advocates for all veterans and has access to many programs and services. She can also help with scheduling appointments, access to VA facilities and educational benefits. There is no charge for these services. To learn more call the Community Center at 647-3116. Learn the basics of birding with the Lakes Environmental Association from 4-5:30 p.m. Tuesday, April 16, at the Maine Lakes Science Center on Willett Road (behind Hannaford). The course fee is $5 for LEA members and $10 for nonmembers. Other LEA events this month include a Spring Ecology Family Fun Day April 18, a vernal pool walk at the Highland Research Forest April 24 and a vernal pool exploration with the Greater Lovell Land Trust April 27. For more information on any of these events contact alanna@mainelakes.org. Join Loon Echo Land Trust at 5 p.m. April 22 to celebrate Earth Day with an easy, two-hour hike in Bald Pate Mountain Preserve. This fun annual event is kid- and dog friendly. Be sure to wear proper footwear and bring water and snacks. Participants are asked to share an original or favorite poem that embodies the spirit of Earth Day. This event is free but registration is required. Call Jon Evans at 647-4352 or e-mail stewardship@lelt.org. The Friends of the Bridgton Library is looking for additional volunteers so it can hold its annual book sale July 6. It welcomes new members to help with all activities and fundraisers in support of the library. To volunteer and to indicate whether you’d like to attend an informational session on the Friends group, take a quick survey on the library’s website, bridgtonlibrary.org. Join Loon Echo Land Trust and and Maine Appalachian Mountain Club volunteers April 27 to spruce up the Ledges Trail on Pleasant Mountain after a long winter. Tools and training on trail work techniques will be provided. This work-day will be strenuous and participants should be prepared with appropriate work clothes (pants and sturdy boots) along with plenty of water and snacks. Volunteers should meet at the Ledges trailhead parking area at 8:45 a.m. To register, contact Jon Evans, LELT stewardship manager, 647-4352 or emailing stewardship@lelt.org. Lakes Environmental Association will hold a sesson on the basics of birding April 16 at the Maine Lakes Science Center. 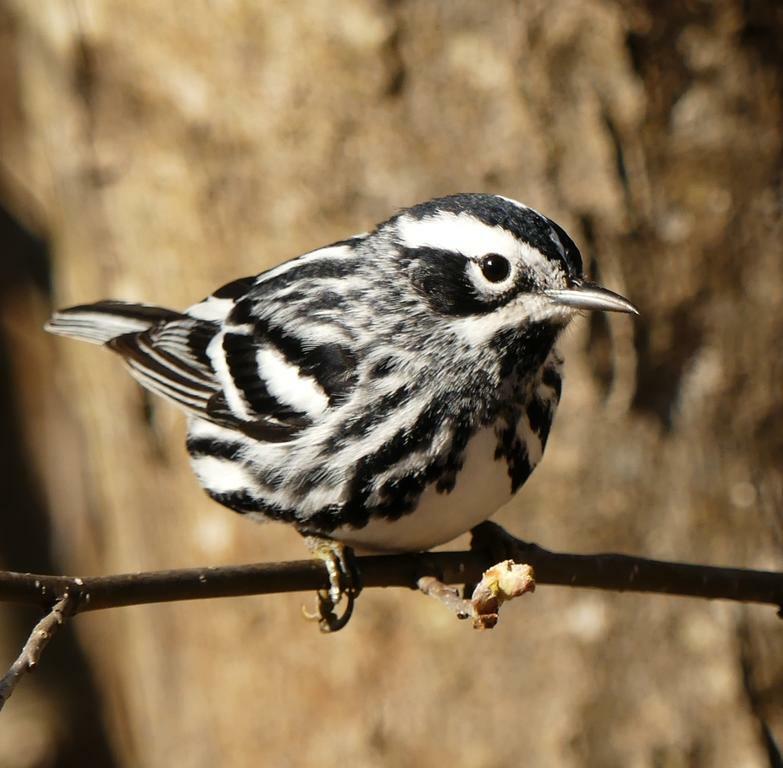 Above is a black and white warbler. Take a hike in Bald Pate Mountain Preserve April 22 to celebrate Earth Day with Loon Echo Land Trust.